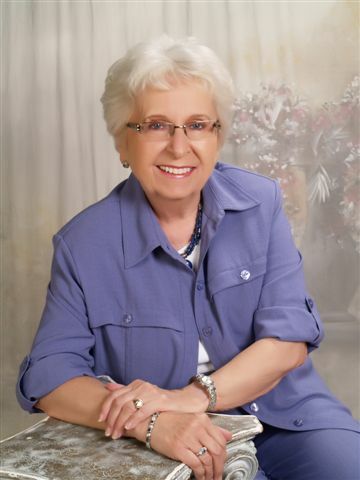 Doris Kenney Marcotte is the author of “The Beads of Lapis Lazuli”, 2011 EVVY Award for Fiction, 1st Place. You can contact her at: dmarcotte@cinci.rr.com. I became interested in writing about the lost civilization on the Greek Island of Crete during a sailing holiday. I love the water. We have a house on the banks of the Ohio River, and every summer my husband and I spend most Sunday afternoons racing a 19’ sailboat on a small lake north of Cincinnati. For a lot of years, we have enjoyed challenging vacations chartering sailboats with friends, island hopping in the Caribbean and the Mediterranean. Since we never have a professional crew, every sail has been an adventure filled with way too many chills and thrills. 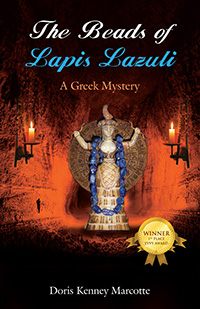 “The Beads of Lapis Lazuli” was written because of a sailing vacation in Greece. When we visited the island of Crete, I saw the remains of the lost Minoan civilization and I was so impressed I wanted to know more about those mysterious people. Who were they? Why was their existence hidden for so many thousands of years? All they left behind were pictures: exotic scenes on frescoes, pictures embedded in knives, drawn on pottery, or engraved on the crowns of rings. After spending years searching for every scrap of information I could find about the Minoans, a people who were different from any civilization anywhere else on earth, I began writing “The Beads of Lapis Lazuli”. I turned some of my research about the Minoans into a novel. Since the Minoans were a matriarchy, I chose a housewife to be the main character in the story. She is a composite of every serious homemaker I have ever known, all of them women who have shown great strength and courage. I combined the family dynamics of dozens of friends and family, recounted a few of my own harrowing sea adventures, mixed in years of research about the ancient Minoans, added a touch of ESP and reincarnation, used Crete as the backdrop, and you have my personal recipe for writing “The Beads of Lapis Lazuli”. Being from the Midwest, I could not take advantage of the CIPA College classes, but Iapplaud CIPA’s mission to help writers and promote self-publishing. I have taken hundreds of writing classes and attended many writers’ conferences. After spending time trying to find an agent, I finally realized that I really didn’t want to sell my book to a traditional publishing house. I wanted to create the cover, chose the title, and edit the content myself. I had to self-publish. It was great fun taking a picture of my little statue of the Cretan Snake Goddess with my strand of blue beads draped across her arms. I chose a title I liked, used the background created by a talented artist at Outskirts Press, and created the cover for the book. It was a thrill beyond description when I first held the finished book in my hands. It was real and I did it myself. The beauty of using Outskirts Press as my publisher is that they are a full service company. They offered everything I needed – I knew nothing about interior design. I was able to pick and chose the help I needed, and I had total control start to finish. Currently, I am working on an historical novel, “The Age of Silver”. It has been very difficult to bring the ancient Minoans back to life. Their culture was amazing, but so little is known about how they lived that it has taken years to write their story. I’m also working on a second fun novel, a mystery, with the title of “The Man Inside the Safe”. “The Beads of Lapis Lazuli” is available in paperback and on Kindle from Amazon and Barnes & Noble and is available as an e-Book on my website at www.outskirtspress.com/thebeadsoflapislazuli. FYI: Outskirts Press has nominated “The Beads of Lapis Lazuli” for their “Best Book of the Year Award” competition. Voting is open to the public April 15 through April 30 on their blog at www.Outskirtspress.com I would very much appreciate your vote.